The teal spots represent the ones I talked about in my previous Paris post (the hotel we stayed at Maxim Folies, Cafe Pinson, and The Louvre Museum). In this post I’ll be showing you what we saw after that (the red spots). 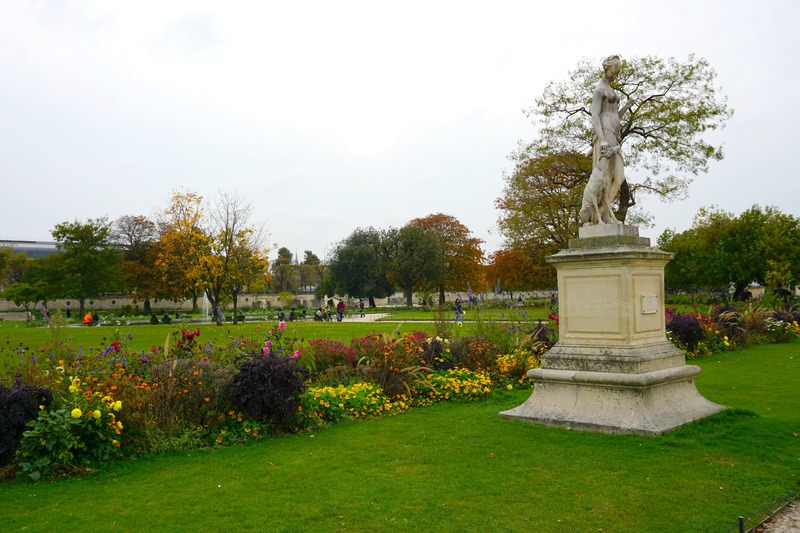 Right next to the Louvre is the gorgeous- Tuileries Garden. I can’t believe I took that pic like, is this real life? 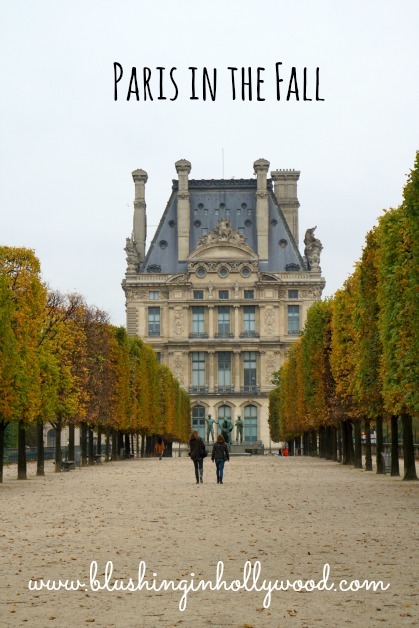 It’s an absolute no-brainer to take a stroll in this park after the Louvre. There were just enough people to do good people watching, but not so many that it felt crowded. 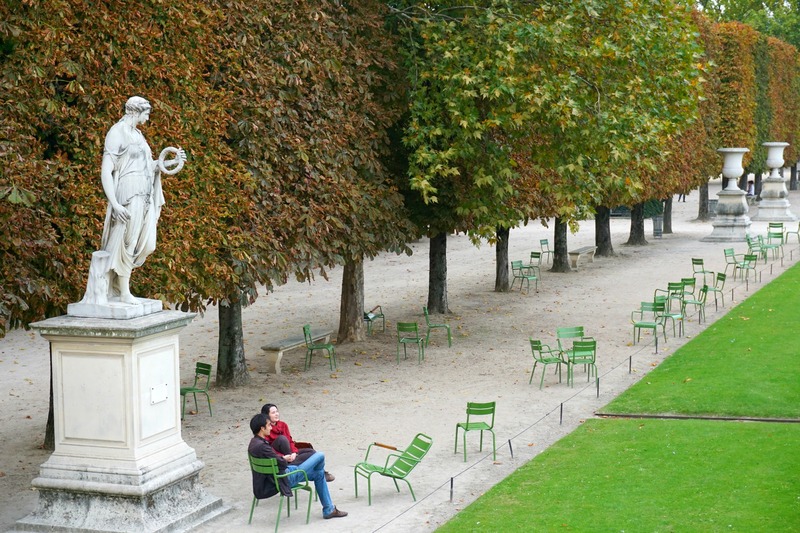 It’s definitely a breath of fresh air after getting out of the very busy Louvre. Ample seating which is lovely. Those gorgeous fall colors! Take me back!! 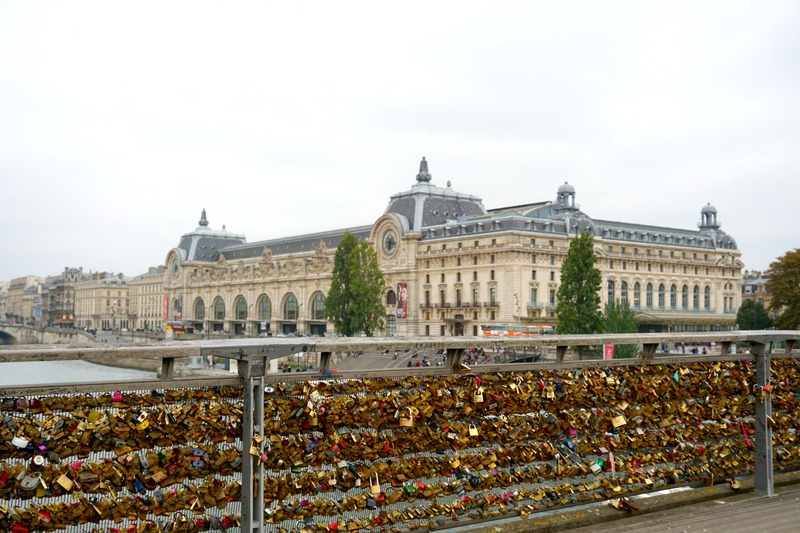 After the garden we crossed the Seine and there are many walking bridges with locks on them so I have no clue which is the OG love locks bridge. They were nice to see since I had heard they were making the bridges dangerously heavy so they were beginning to take them down. 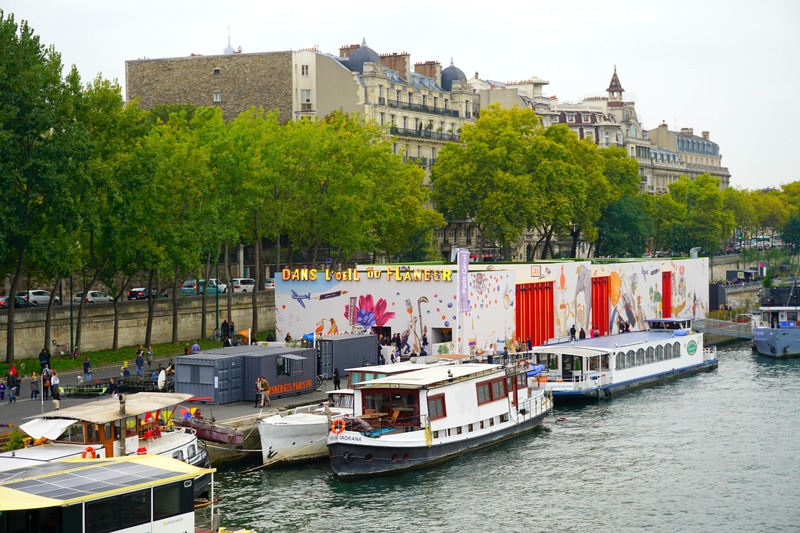 One of the few regrets I have about Paris is not checking out the Hermès exhibit “Dans L’Oeil du Flâneur” no clue how I passed that one up. 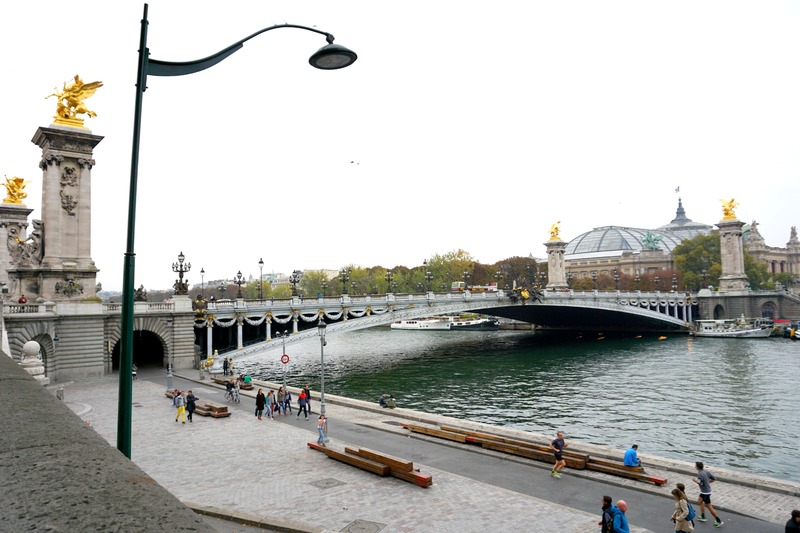 Luckily we ran right into my favorite art of the whole trip- Photoquai 2015. This was an exhibit showing young or newly discovered photographers from around the globe and it was absolutely incredible. I’m sorry to say it only went until 11/22/15. I really loved the stories with the photos. 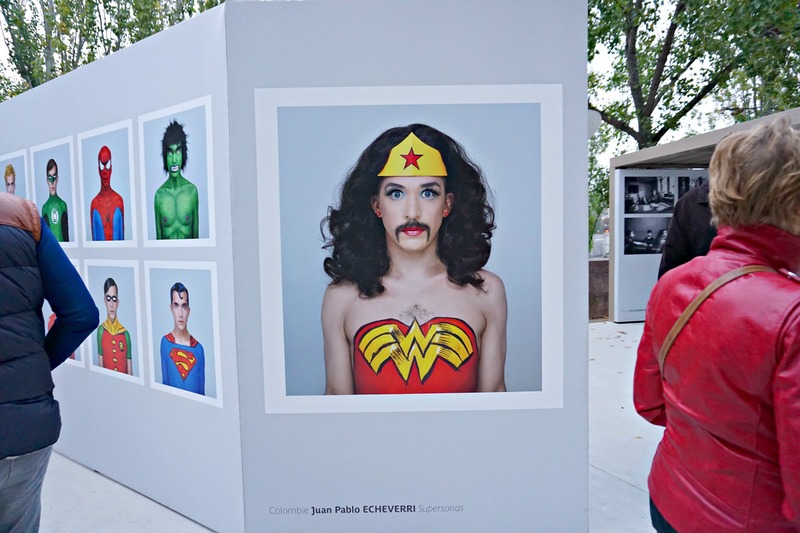 This one is by Juan Pablo Echeverri and it’s called Supersonas. He used self-portraits to imagine what if superheros needed passport photos? I highly recommend you check the whole thing out here. 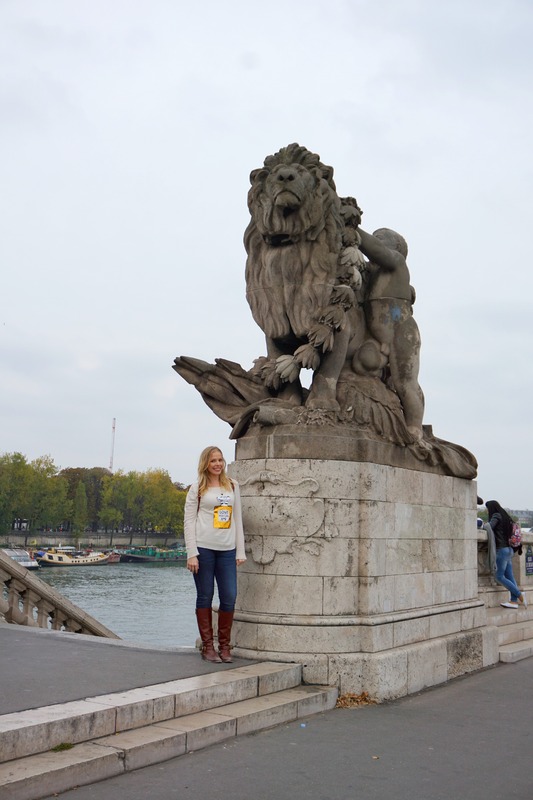 We continued our walk by the Seine towards the Eiffel Tower and the Leo in me couldn’t resist taking a pic with this huge lion statue. At this point we were both starting to wonder just how much longer this walk was going to be. 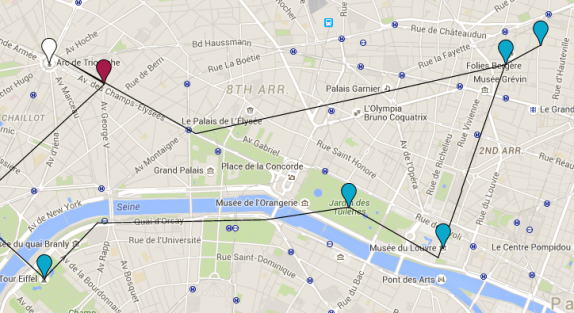 We could see the Eiffel Tower from The Louvre and could tell it was far, but weren’t sure exactly how far. According to Google maps it is a 44 minute walk from The Louvre Museum to The Eiffel Tower and 3.5km- whatever that means I wasn’t in Europe long enough to remember the metric system. 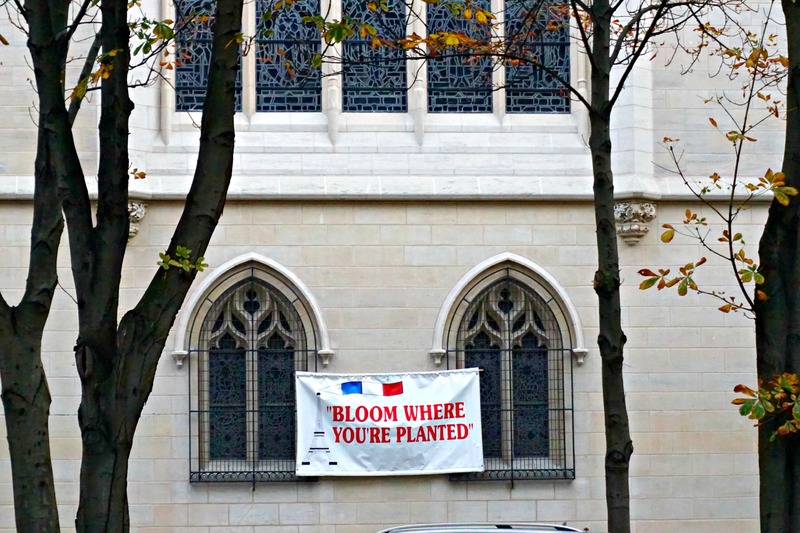 I just googled this and “Bloom Where You’re Planted” is a day-long seminar to help English speaking ex-pats adjust to live in Paris. Hmm.. may need to remember this for the future.. The red dot is the Eiffel Tower. The blue dots are the places I’ve already been and the white is where I went after. Just as the sun was setting we finally made it! It was right as the sun was setting which was an awesome time to see it because as it became darker the light show started. 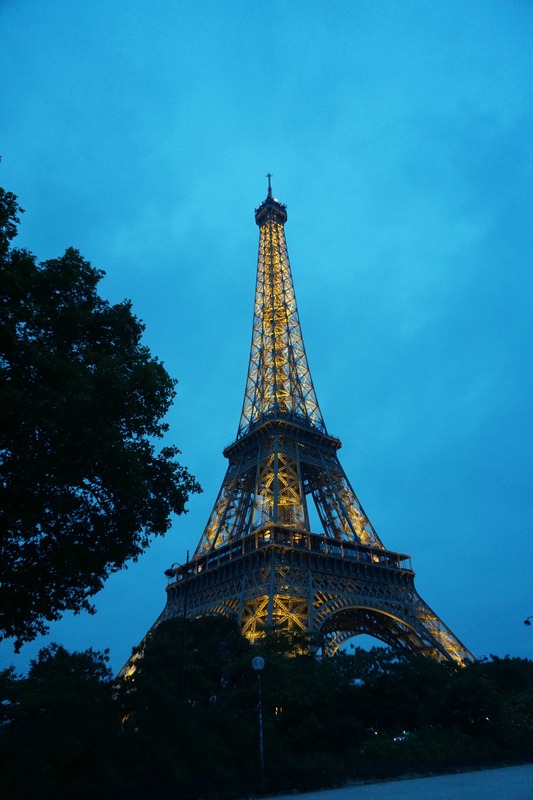 Photo I took of the Eiffel Tower at twilight. This is one of my favorite photos I’ve ever taken in my life! You can go up the elevators in the Eiffel Tower, but not to the very top. There’s also a super high end fine dining restaurant there if you want to spend a few hundred Euro. Molly and I decided to just take a bunch of selfies around it and then continue exploring. At night the Eiffel Tower has a light show where it does that sparkling thing that you’ve definitely seen in movies and on TV. It’s pretty amazing. 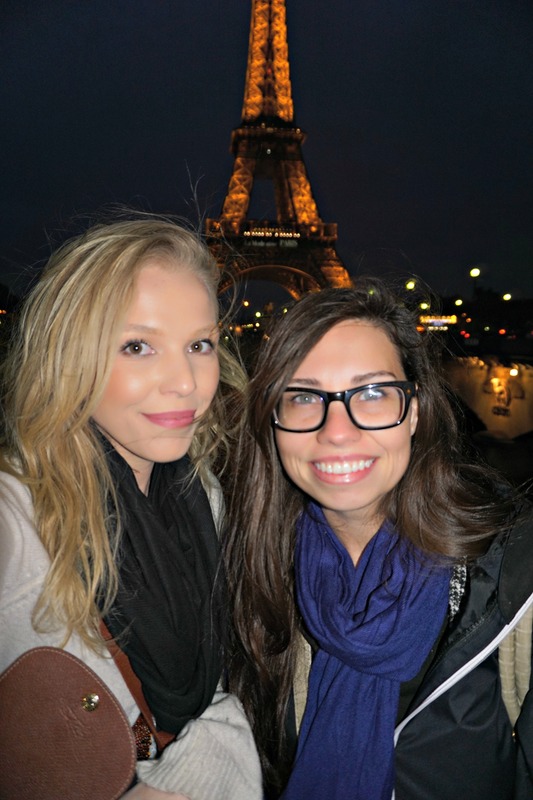 Me and my friend Molly in front of the Eiffel Tower. 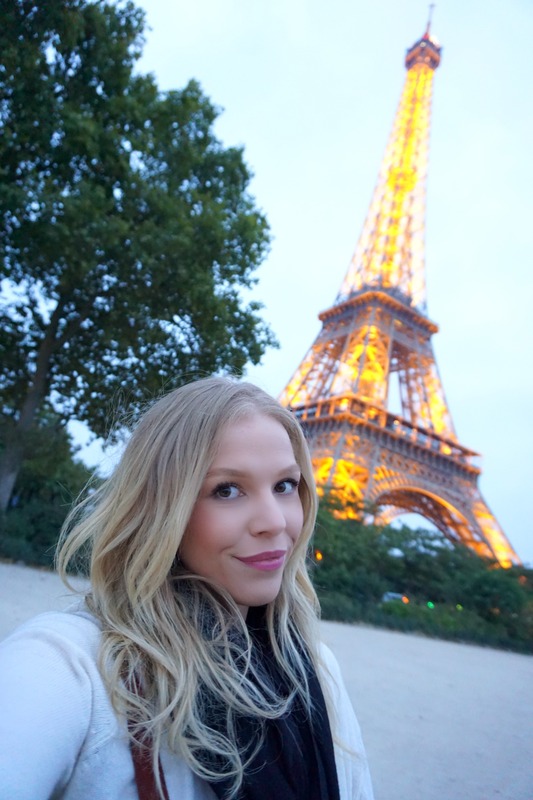 One thing Paris is not conducive to- good hair days. So we had no clue where the hell we were going after the Eiffel Tower, but we decided to wander up to the Champs-Élysées which I still can’t pronounce, but it’s sort of like “lay-SHAWmz-day-leeZAY” you can listen to the pronunciation here. 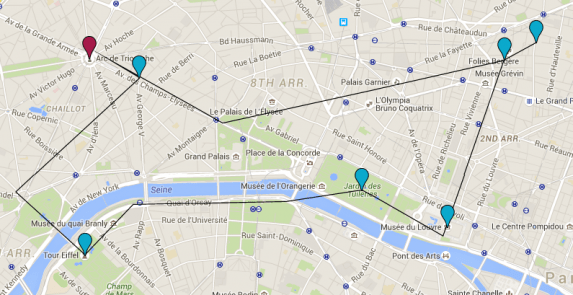 The red dot is the Champs Elysees. The blue dots are the places I’ve already been and the white is where I went after. 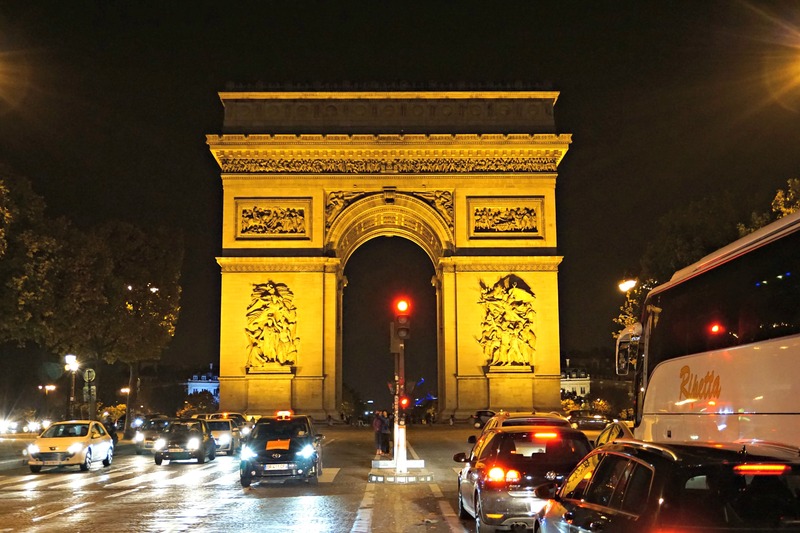 Champs-Elysees is a street that’s important because it has all the fancy stores (Louis Vuitton flagship) and restaurants (Lauduree with the fancy macarons). It also has tons of not so exciting chain stores as well. Molly and I wandered almost zombie-like at this point after our long day up one side to the Arc de Triomphe and down the other side. 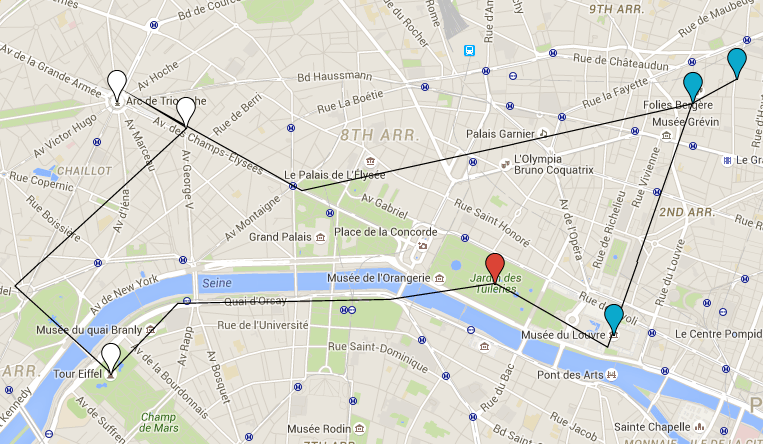 The red dot is the Arc de Triomphe. The blue dots are the places I’ve already been. After starting down the other side of the Champs we couldn’t figure out where to eat and/or drink. We happened upon a group of about 8 extremely well dressed gentleman including one in a full floral suit. They seemed to be from various English speaking places and we just followed them for a while like a couple of creeps and then decided to let them live and ceased the stalking before any interaction happened. Great story, I know. 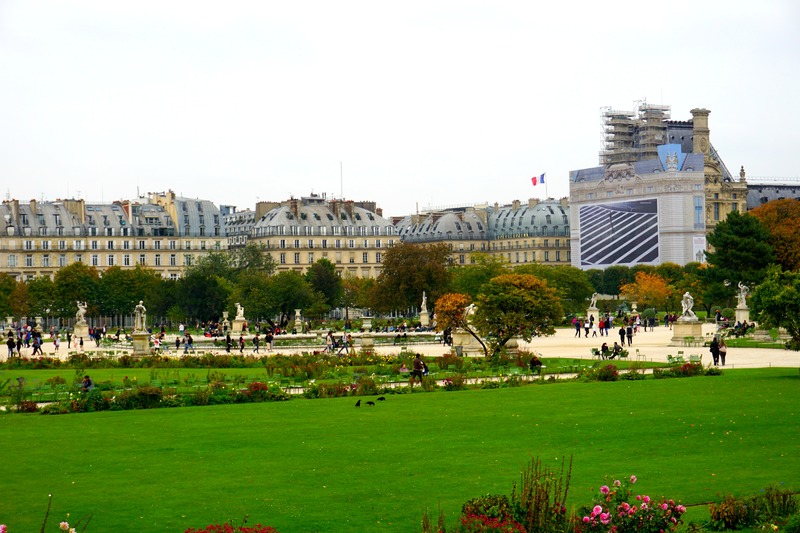 You can read more about the Hotel Maxim Folies in my previous post Traveling to Paris and The Louvre. 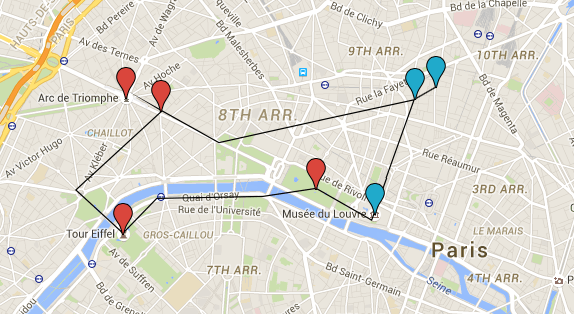 The red dot is the Hotel Maxim Folies where we started and ended that day’s walking adventure. 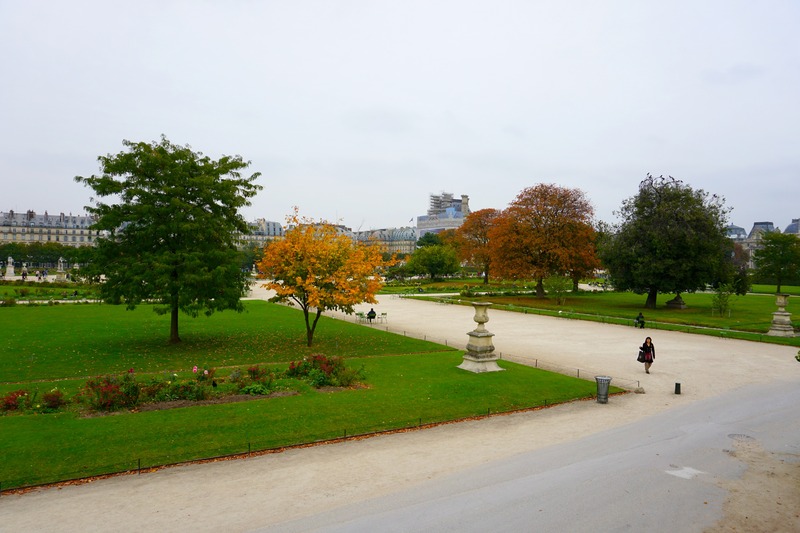 As you can see it is quite a walk from the Champs-Elysees to the Hotel Maxim Folies (red) and after that trek Molly and I were starving and freaking exhausted. We then came up with an excellent plan that I highly recommend- ordering takeout in Paris. This is our picnic that we had on our little hotel beds. Our delicious take out order in Paris. Trying to Google translate French takeout menus and guess what they are talking about and then getting surprised once it arrives is highly entertaining and this food was really good and reasonably priced! 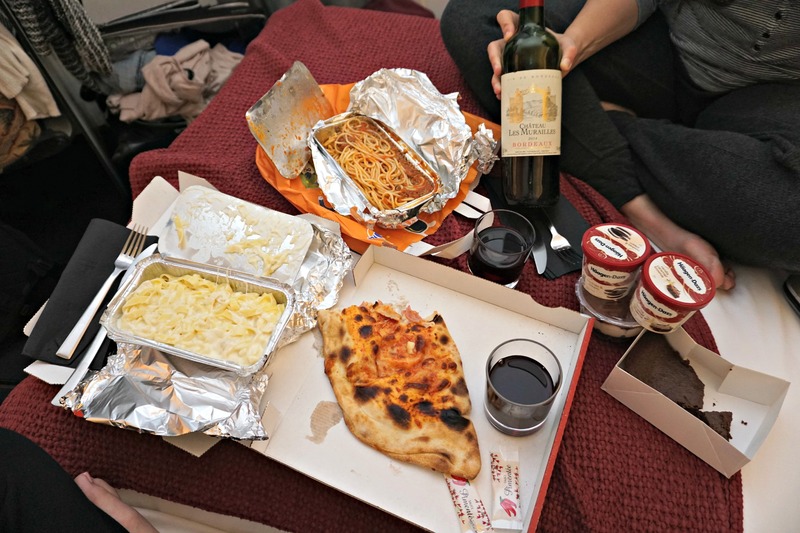 It’s some kind of ham and cheese calzone, a gorgonzola pasta, spaghetti bolognese, a bottle of Bordeaux that I think might have been free with our order, Tiramisu, Haagen Daaz, and chocolate cake. Yum. While we ate our picnic we watched one of the many Paris-themed videos I downloaded on my iPad- Picture Paris with Julia Louis-Dreyfus which is a freaking hilarious short film that I highly recommend. I downloaded it on iTunes. 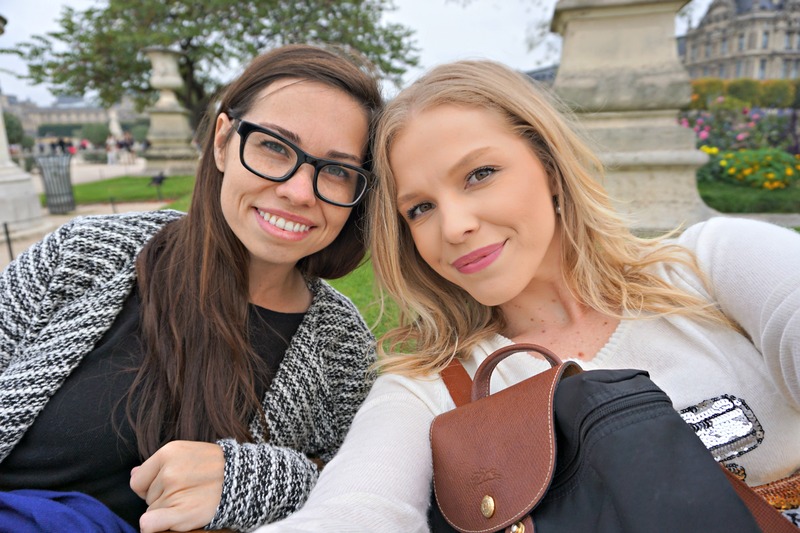 Today’s post is about my day in Paris on October 4th, 2015 and my last post about Paris went up on the blog on November 4, 2015. 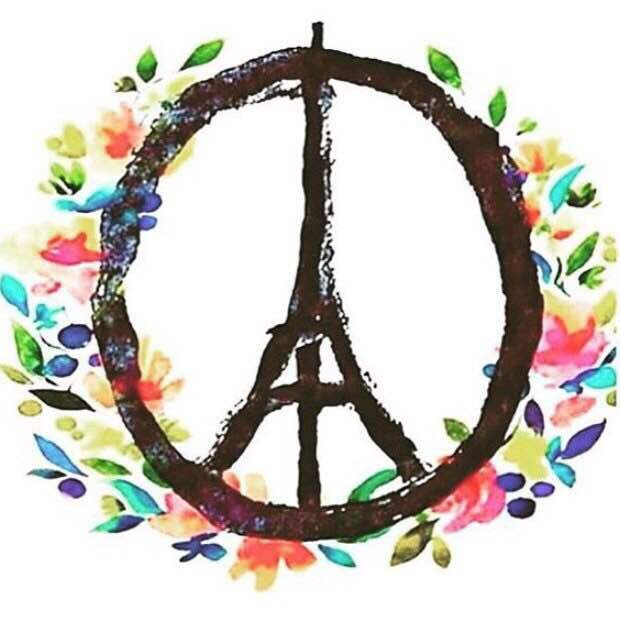 Since then, on November 13th, the terrorist attacks in Paris occurred. After visiting this truly magical place it is unfathomable to me how or why someone could want to destroy it along with the people who live there. It’s just such an incredible place I hope this post did it justice. I would absolutely go back in a heart beat. As my incredibly depressing recorded audio tour on the hop-on hop-off bus in Paris reminded me, there has been a lot of death and destruction in Paris for thousands of years and the city and it’s people are as strong and awesome as ever. Don’t live your life in fear and always let your loved ones know how much they mean to you.